Linguine with Clam Sauce (always with canned clams in 1950-60’s Chicago) was a staple everynight dinner when I was growing up. My dad particularly liked the version with red sauce. Me, I liked both red and white, but always thought the white was “prettier.” It’s such an easy dinner because it’s made from pantry items, and other than folks who are allergic to seafood, I’ve never run across anyone who didn’t like it. Since I’m a person who’s always played with my food, I decided to make a deluxe version of the old standby, adding my favorite veggie – Broccoli Rabe for a bit of tang, and Cremini mushrooms, because they were in the fridge. We loved the results. It made many more servings than I expected, but the leftovers were just as delicious. Heat a large sauté pan with a lid. Over medium heat, add the olive oil, and when it has spread over the bottom, add the chopped onion, then the mushrooms. Add the herbes de Provence, white pepper and sea salt. Add the broccoli rabe and garlic. It should all fit into the pan. If it doesn’t, move it around until it starts to wilt down. Add all the clam juice drained from both cans of clams, and the wine. Lower the heat. Cover the pan and cook until the rabe is totally wilted. Meanwhile, cook the linguine in a large amount of well salted boiling water until al dente. When the rabe has all wilted down, uncover the pan and raise the heat to cook down the liquid in the pan to 1/4 cup. When the linguine is cooked, add the chopped chorizo and all the clams. Stir in the crème fraiche. Now add all the drained pasta to the pan and toss to combine sauce and pasta. 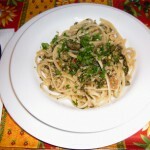 Serve in warmed soup/pasta bowls garnished with chopped flat leaf parsley. You know me. It’s not “dinner” without a glass of wine! A great pairing for this meal in a bowl would be Banfi’s Principessa Gavia, one of my favorite “everynight” wines for fish.